The Lake Michigan Mermaid is a finalist in a National Book Competition Sponsored by ForeWord Reviews. 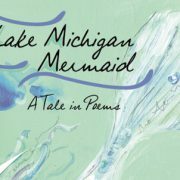 The Lake Michigan Mermaid is a finalist in this national book competition for independent, university, and small presses sponsored by ForeWord Reviews for the following prize: “2019’s ForeWord Book of the Year Award in Poetry”. https://www.lindanemecfoster.com/wp-content/uploads/2017/09/LindaNemecFoster_LOGO.png 0 0 Administrator https://www.lindanemecfoster.com/wp-content/uploads/2017/09/LindaNemecFoster_LOGO.png Administrator2019-03-26 09:30:252019-03-26 10:00:06The Lake Michigan Mermaid is a finalist in a National Book Competition Sponsored by ForeWord Reviews. The Lake Michigan Mermaid is a Finalist in a National Conest for Superior Cover Artwork by the Eric Hoffer Book Awards. The Lake Michigan Mermaid is a finalist in this prestigious national contest given for superior cover artwork by the Eric Hoffer Book Awards for the following prize: “2019’s The da Vinci Eye Award”. https://www.lindanemecfoster.com/wp-content/uploads/2017/09/LindaNemecFoster_LOGO.png 0 0 Administrator https://www.lindanemecfoster.com/wp-content/uploads/2017/09/LindaNemecFoster_LOGO.png Administrator2019-03-26 09:00:242019-03-26 10:05:32The Lake Michigan Mermaid is a Finalist in a National Conest for Superior Cover Artwork by the Eric Hoffer Book Awards. This annual award honors 20 acclaimed books from over 300 titles submitted. The Lake Michigan Mermaid is among those celebrated. To view the full list, click here to visit the Detroit Free Press website. The Lake Michigan Mermaid was honored as a “2019 Michigan Notable Book” by the Library of Michigan. To view the full list of Michigan’s Notable Books (including Michigan Radio’s interview with Linda Nemec Foster & Anne-Marie Oomen), please click here to visit the Michigan Radio website. 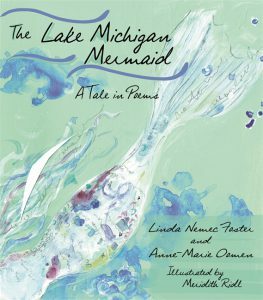 Linda Nemec Foster and Anne-Marie Oomen’s latest poetry book, The Lake Michigan Mermaid, has been recommended by Michigan Public Radio in their 2018 Book Gift Guide! Click here to view the full Michigan Public Radio 2018 Book Gift Guide. Linda Nemec Foster was recently interviewed on a episode of WYCE’s Electric Poetry hosted by Kelsey May Fraser, which aired on 9/11/18. To listen to the full interview, click on the play button below or click here to visit WYCE’s website. Linda Nemec Foster is the author of 11 collections of poetry, including The Lake Michigan Mermaid (Wayne State University Press, 2018), coauthored with Anne-Marie Oomen; Talking Diamonds (New Issues Poetry & Prose, 2009); and Amber Necklace from Gdańsk (Louisiana State University Press, 2001). 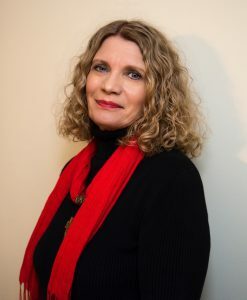 Her work has been published in anthologies, magazines, and journals, including the Georgia Review, Nimrod, Quarterly West, Witness, New American Writing, North American Review, and Verse Daily. Her poems have been translated into European languages, have inspired original musical compositions, and have been produced for the stage. Linda’s new book, The Lake Michigan Mermaid, is reviewed in NewPages which is a major online source for book reviews, publishing, and the literary world. To read the full review, please click here! The Lake Michigan Mermaid, co-authored by Linda Nemec Foster and Anne-Marie Oomen, is selected as one of the top ten books by Michigan authors for Summer, 2018. To read the full article detailing the Top Ten Books, please click here!